Aug 8 (AZINS) Maratha groups have yet again called for a complete shutdown in Maharashtra over the issue of reservation in jobs and education. The Thursday Bandh comes after the successful July 25 shutdown, which was marred by sporadic incidents of violence. However, confusion reigned supreme over Thursday’s bandh. The reason being the— there were two versions of bandh that were announced on Wednesday — one said that Maharashtra including Mumbai will remain shut down, while another said Thane and Navi Mumbai were excluded. Amid the palpable tension, Maratha leaders have assured the people that the Thursday Bandh will be a peaceful protest. The leaders have issued a set of ‘guidelines’ to the activists that tells them to not engage in any violent protests. However, the same guidelines also asked the activists that each unit must ensure the Bandh was successful. 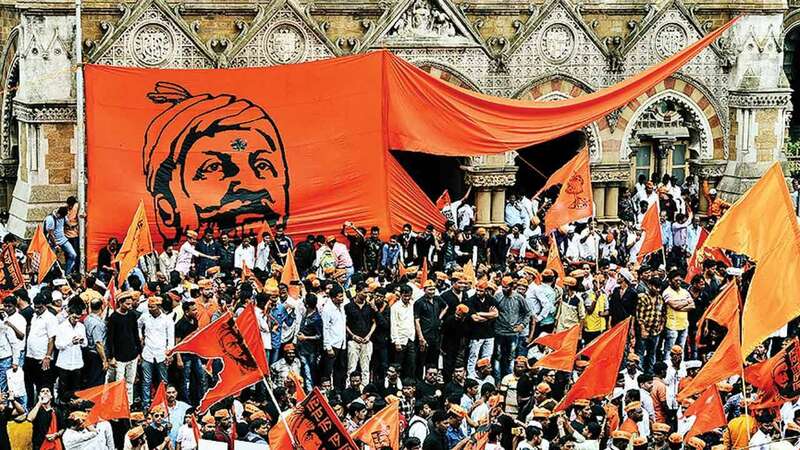 Maratha Kranti Morcha, which has been spearheading the quota stir in the state, said that the essential services and schools, colleges etc were excluded from their Bandh. The Devendra Fadnavis government has left it to the schools and colleges administrations to decide their course of action. Keeping in view of the troubles faced by flyers last time, airlines have issued advisories to people asking them to keep extra time in hand in view of the Bandh. The BEST administration has said they will run services normally, but will divert buses from routes in case of violence. The Railways have deployed additional forces at stations that faced violence last time. “Our protest will be peaceful, but we have to also show the community presence in large numbers. We are not here to harass the common people,” Maratha Morcha Convener Sanjeev Bhor said. Another leader Amol Jadhavrao said that they had requested various workers union including BEST, taxi to extend the support to their bandh on Thursday. “We had also received the support of many social and community groups and unions. We had accepted the Gandhian way to put forth our demands,” Jadhavrao said. 1. Bandh will be observed peacefully in entire Maharashtra including Mumbai from 8 am to 6 pm. 2. It should be peaceful. 3. No government or private property should be damaged. 4. All community members must ensure bandh is observed fully in their areas. 5. It’s our responsibility ensure law and order is maintained. 7. Essential services have been excluded. 8. Please verify what you see on social media. 9. Do not believe in rumours. 10. Maratha members must prepare their action plan in a calm way.